Total distance: 2100 km (1300 mi). Tour date: August 1994. I met with a friend in Seattle, after Delta airlines delayed me for a day because the pilot discovered that he didn't really have enough fuel to fly from Orlando (Siggraph 94 was in Orlando) to Salt Lake City and decided it might be a good idea to get some more in Memphis, which naturally meant that I missed the Delta connection to Seattle. That experience fit right into my prejudices against Delta. They never got me anywhere in time. Well, I finally made it to Seattle and rode through some unremarkable industrial part of town from the airport to the youth hostel. I can recommend that youth hostel, a great place to stay. Bring a padlock for the lockers. We spent some time sightseeing, but cities weren't really on our agenda so we took the ferry across Puget Sound and started south, after stocking up on fruit at the farmer's market. We skipped the olympic park and rode south to the coast. All this with perfect weather, I am told it rains a lot in Seattle and Portland but we got a total of one hour of rain during the entire trip. Anyway, our first stop at the coast was Westport, just after boring Aberdeen. 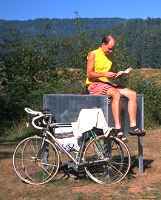 The guide (Bicycling the Pacific Coast, Kirkendall/Spring, The Mountaineers, ISBN 0-89886-232-9 - don't ride without it) made Westport sound promising, but it turned out to be an almost comically depressing collection of wooden shacks and cracked asphalt. Well, we bought some nasty artificial tasting pastries, climbed the view tower, shook our heads and got out of there. It seems chainsaw carving is the great thing there. I am not kidding, they had a contest there and sell chainsaw-carved, hm, art masterpieces everywhere. Speaking of food, the picture shows soft drink bottles. The bottles are made of clear plastic, the bright color is the color of the liquid! The road ahead is so beautiful, passing through many unpopulated stretches along the coast with view of the Pacific Ocean, through parks and forests, that there is really little reason to submit to the plans that local village tourist offices had for our vacation. Riding in Washington was easy. The roads mostly have wide shoulders and there wasn't much traffic. We had several tunnels, like the one shown in the picture. 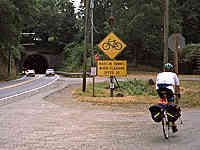 These tunnels had a button at the entrance for bicyclists to press that turns on flashing lights and warns motorists that there are bicycles in the tunnel and they might perhaps consider driving carefully. We were lucky and always had downhill tunnels, and didn't meet any logging trucks in a tunnel. A logging truck is a huge truck loaded with logs, and can be rather frightening when passing at high speed. They are more indigenous to Oregon though. We left Washington on a very long bridge to Astoria in Oregon. This bridge begins level and then has a steep incline, followed by a curved decline into Astoria. It turned out to be rather dangerous because of gaps in the road surface and one certain RV driver who didn't have a clue how wide such an RV really is. Adrenalin city. The best part of the trip began in Oregon. 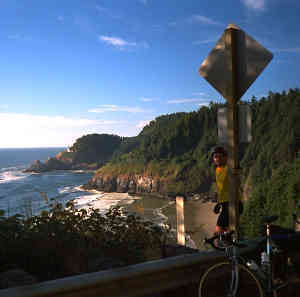 We decided to ride into Portland, the largest city in Oregon, which was a mistake. Highway 30 from Astoria to Portland has a lot of traffic, is rather un-scenic, and gets more so the closer we got to Portland. Just when we thought it couldn't get any worse we found ourselves in a pleasant downtown area with excellent sidewalk cafés though. Compared to the breathtaking scenery we found elsewhere on the coast, the amenities of a city aren't really worth the traffic; next time I'll stay at the coast whenever possible. The real trouble with Portland is its youth hostel. It looks nice enough from the outside, but it's a mixture of refugee camp and makeshift detention facility inside. We were stowed in the dark and smelly basement, one huge room with beds everywhere and a bathroom that makes Alcatraz prison look like the Hyatt Regency. The windows were below ground and barred. If there had been a fire we'd all be dead. The other room was built from some two-by-fours leaning against the house, holding up a transparent plastic tarp in the yard. Incredible. Riding out of Portland back to the coast isn't easy. There is no motel and no campground all the way to the coast. 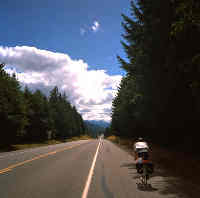 The road is scenic, mostly farms and forests, like in the picture. We didn't expect this long trip and eventually ran out of food and patience, when we found this small farmer's market at the roadside. We ordered a milkshake and a strawberry shortcake. The former would have fed your average African country for a month, and the shortcake consisted of some large slabs of shortcake on a huge plate, which was then completely covered with delicious fresh strawberry sauce, plus a shocking amount of whipped cream on top. Patient excavations that took a long time revealed the shortcake, but by that time we were bursting. I have a picture but it doesn't look nearly as impressive as the real thing. 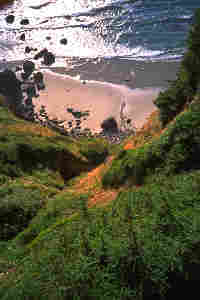 The first picture looks down to the ocean from a bridge; the second is a view of one of the many small bays. 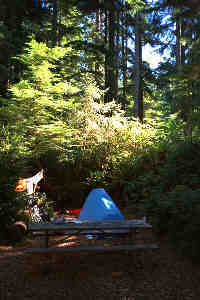 The fourth is our tent site in the Honeyman State Park, the best campground I have ever seen. The hiker/biker site is located in the middle of a forest, with little clearings for the individual sites. The sleeping bags in the background of the fourth picture are nearly roofed by huge tree roots. 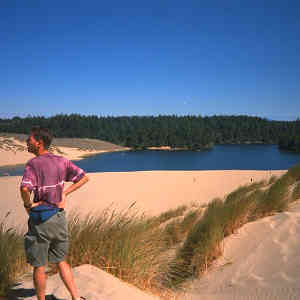 The campground also has its own lake for swimming and for renting boats, and huge dunes, shown in the third picture. This is the only place where we stayed two nights. At the small town of Bandon, the experiences in Portland were still strong in our minds and we made the mistake of staying in a motel instead of in the youth hostel. They offered a nice view of the sundown but the motel itself was unreasonably expensive and practically falling apart despite its clean looks from the outside. Large gaps in the ceiling, a moldy bathroom, junk furniture... The youth hostel is supposed to be good, and the town itself tries hard to be interesting (but closes down early at night). There are huge redwood forests in northern California. But first, right after the friendly sign saying "Welcome to California", there is a border station where valiant customs officers save the state from certain destruction by inspecting your foodstuff and making sure you are not illegally smuggling fruit flies into California. The station itself is not unlike the checkpoints we used to have at the Berlin Wall, except those tended to not simply wave bicyclists past. Whew. Here the tour description joins with another West Coast tour from Crater Lake in Oregon to San Francisco. The redwood forests begin near Crescent City, which also has a visitor center for the Redwood National Park. There are all sorts of silly tourist attractions such as the drive-through tree, a large tree with a tunnel dug through it. We didn't bother checking it out, but judging by the ubiquitous postcards it's twice as wide as the tree in the picture to the right. The small white speck on the right is my friend, for reference. As usual, the campgrounds there are spectacular, with nature trails to explore the forests. That's where the picture was taken, in the Prairie Creek Campground halfway between Crescent City and Eureka. The campground sports large numbers of elks that don't seem to mind all those silly tourists taking pictures. Eureka is a boring town with a long industrial section and busy roads. Their main postcard attraction is Carson Mansion, a case study of how many silly-looking ornaments you can stick on a house. It's a private club and can't be visited. After Leggett hill, at 600 meters the highest hill on this trip, we passed a sequence of cemetaries and wondered if that hill might have been more of a challenge to other cyclists. Just when you have completed the descent and think the hardest part is over, the road begins a sequence of rolling hills with countless little climbs. The next interesting stop was Point Reyes, which also has a wonderful youth hostel hidden in a large wildlife preserve. Wildlife apparently included raccoons. 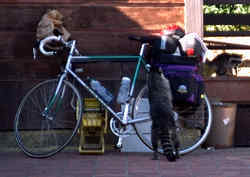 The picture shows one investigating the zippers of my panniers, while a second raccoon on the porch on the right stands guard. Point Reyes is just north of San Francisco. 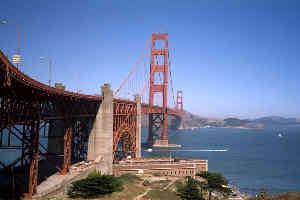 We stayed with friends in San Rafael and used the ferry and the Golden Gate Bridge to get to San Francisco. The bridge, one of only two in the Bay Area that can be used with a bicycle, reserves the western sidewalk for cyclists on weekends, and of course no toll needs to be paid. I realize that I cannot possibly write a report of a tour to San Francisco without showing the Golden Gate Bridge, so here is the inevitable picture. Just north of San Francisco, on the other side of the Golden Gate Bridge in Sausalito, the best ice cream I am aware of in the Bay Area can be had at the Hawaiian Ice Cream shop across the street from the ferry pier. [The quality went downhill since; Thomas 2001.] Sausalito is very touristy but a pleasant place to visit with a great view of the bay and San Francisco, and ferries to various destinations. We later stayed in the Mason Street youth hostel in San Francisco because Fort Mason was full, and did all the usual sightseeing, including Berkeley. I know San Francisco rather well and lived for a long time in Palo Alto, where we also spent some nights. There is something about not having to worry about a sleeping bag wet with dew in the morning. Naturally, we stocked up on bicycle parts and clothing at Performance in Redwood City and Palo Alto Bicycles, bicycle clothes tend to be significantly cheaper in California than here in Berlin. One year later, I rode from San Francisco to Los Angeles. There is another page describing that trip. 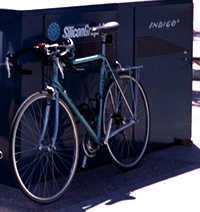 I had an appointment with Silicon Graphics and can't resist the opportunity to show a picture of their bike racks, shaped like some of their computers. Well, more or less.